We do not deal with companies, we deal with people. Our partner and supplier of the best quality fingerlings and associated aquaculture knowledge in South Africa. Nick James has spent decades perfecting the right strains of fish to achieve the best results for a large and diverse client base. Jojo Tanks have been with us from the beginning of our venture and have supported us with our goals and visions. Their worldclass facilities and engineers allow us to design and develop the highest quality and most cost effective system components in the market. With decades of experience in effective organic pest and disease control, Real IPM a leader in biological control for commercial agribusiness applications and has joined us to bring solutions for the aquaponic industry – making previously unavailable commercial products avialable to everyone. Microcare is a Proudly South African company established in 1990 in the friendly city of Port Elizabeth in the beautiful Eastern Cape. They design, develop, manufacture, and supply quality solar electronic equipment using the most efficient technology to bring our clients the best possible price and most appropriate products. They also offer development of new technology based on customer’s specifications. 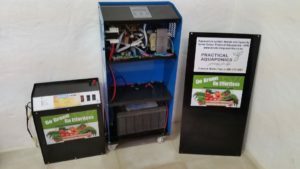 In this regard, they have partnered with HPA in developing Energy Back-up systems and components that are specifically built to manage HPA Aquaponics systems with a rugged UPS model and a Complete off the Grid option for more than fair prices. This partnership sets HPA ahead of the pack when it come s to innovation in Aquaponics. Microcare has been manufacturing solar components for 26 years with the MD Jimmy Catt having been involved in manufacturing solar electronic components for over 40 years. With a combined 70 years of electronic knowledge and innovative design expertise Jimmy heads a dynamic team responsible for being the only South African company to manufacture MPPT Solar Regulators, Pure Sine Wave Bi-Directional Inverters, Grid-Tied Inverters and the unique Grid Tied Limiter on one premises in Port Elizabeth. All products built use the best possible components sourced from suppliers worldwide using the latest cutting-edge technology and development. Microcare offers assistance with system designs and a comprehensive free generic and tailor made solar course to all installers, dealers, agents, and distributors of Microcare products. HPA is one of these. Microcare teams are available for technical problem solving as well as telephonic backup support and response on repairs within 24 – 48 hours once product and details received! Much like solar energy, Microcare thrive on empowering our local resources to meet a global demand for the best in solar components, hence their slogan: THINK local but ACT global! HPA is proud to be a partner! Our courses and community are geared to eliminating non-productive or experimental Aquaponics, because we have spent the last 9 years doing trials to showcase and prove an appropriate approach to system design. Also that we have an active forum of local and international participants who add value to our clients.